Dreamie performs random acts of comedic creativity at Renaissance Faires and pushes all forms of artwork! 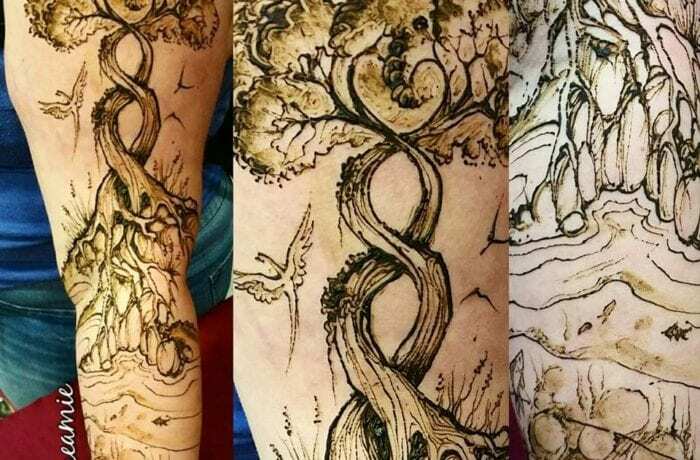 She travels all over the country performing and drawing epic henna tattoos. Dreamie was born and raised in Seattle, WA, but due to an overdeveloped sense of wanderlust lives on the road with her man Thomas Wood the Pyro-juggler. Together they travel all around the country performing crazy acts, making people laugh, and leaving henna tattoos in her wake. Dreamie is a certified scientific illustrator, so when she says she can draw anything, you better believe it! She owns and operates "Hullabaloo Henna Tattoo" where the art is so unusual it starts a hullabaloo!